The Brambus-Jazz-Family was so far dominated by great instrumentalists. 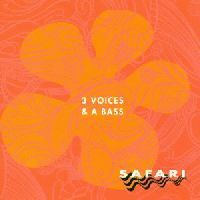 To show that the voice is an important jazz instrument too, we present it here in tripple version with a great ensemble named 3 VOICES & A BASS. The group unites three great and well-experienced voices and an outstanding bass. The members of the band have a long history in music allready and can be found on many releases, not only with brambus. Bassplayer Bänz Oester is one of the most wanted genius in the Swiss music world, covering all from folk to rock and jazz.Three voices as different as their hometowns: Northern Sweden, South Carolina/USA and the inner part of Switzerland unite with the contrabass player from Bern. They found themselves having fun to play together and experience new ways. "Grooves" without harmony or rhythmn instruments have been arranged several time until they found their own forms and come here in a new and fresh way, covering many known songs in a new way and giving a lot of possibilities to work with their voices and with the bass. The recordings cover repertoire, improvisation, folksongs and swinging bebop as well as a bit of blues. There is a lot of fun where these recordings come from and their is a great selection of it waiting for you . Discover the newest members of brambus - and try to see them live as well!